I think there can be no doubt that Toyota had the fastest car in Bahrain, and that by a considerable margin. They did everything right before the race, Trulli producing one of his specialty laps to get pole by nearly half a second, Glock backing him soundly by taking the other spot at the front of the grid. It was all that was required for the team to take its first ever win and, when the two Toyotas retained the lead at the start, victory should have been there for the taking. So what went wrong? Toyota's John Hewett gives us the answer in an interview published in Autosport, as if it were not obvious to everyone: strategy scuppered the team's race from the moment the cars came in for their first pit stop. But the signs were there even before that moment, the most significant being that it was Glock who had grabbed the lead at the start, not Trulli. Regardless of Timo's reputation as being a better racer than Jarno, events were to show that Trulli was the quicker of the two throughout this race. With Glock in front, Jarno could do nothing but follow his team mate through the first stint, with all the consequences to his tires that Vettel mentioned in explaining his inability to pass Hamilton in the same period. That prevented Jarno from getting the gap to Button that he really needed if the Toyota's light fuel strategy were to pay off. Jenson stayed close enough to put in some quick laps when the Toyotas went in and emerged from his own stop in the effective lead. Team orders may be illegal in terms of F1 regulations but a more experienced strategist would have found a way to maximize the advantage of having both cars at the front. And there were reasons why the team should have chosen Jarno as the man to lead from the start. He is quicker than Glock over one lap at least, has more experience and is less likely to make a mistake through excitement therefore; and the famous Trulli train demonstrates his ability to keep faster cars behind, something that was bound to become important once the cars swapped to the harder tire. Timo was also going to have to stop sooner and so was the more likely to run into traffic problems thereafter. It may sound like hindsight, but Trulli should have been chosen to lead the race and Glock to act as rear gunner, slowing the chasing pack to allow Trulli to build the lead he needed to stay in front through the first pit stops. Three laps into the race, the situation was clear - Button was the big danger, Vettel having been neutralized by Hamilton, and the team needed Trulli to get to the front. A brief "mistake" by Glock could have arranged that quite neatly and then the rest of the plan come into play. Even had the team been unwilling to alter the order so cynically, the alternative was to get Jarno to slow sufficiently to limit Button's pace, thereby allowing Glock to pull away. It is a team sport, after all, and the important thing was to grab the win so temptingly on offer. Toyota's F1 presence may well depend on them achieving a win this year and they were fools to let their best chance yet slip through their fingers through strategic mistakes. Of course, the decision to run a long second stint on the prime tires turned out to be a huge misjudgement but, with better management of the early laps, the damage inflicted could have been limited. We saw in the second stint how Trulli could keep Vettel behind, even though the Toyota was considerably slower on the hard tires. It is easy to dissect things afterwards like this but that is the point about great strategists like Ross Brawn - they see beforehand how the race is likely to go, devise a plan to make best use of that, and then tweak the strategy as the race develops. Toyota sat back and let events unfold, disastrously as it turned out. Having said all that, it is encouraging that John Howett seems to have learned the lesson. He admits the error and is likely to be a bit more cynical when looking at strategy in future races. 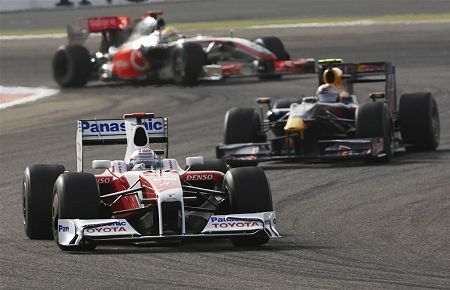 My fear is that it may be too late; Toyota may never again have as big an advantage as they had in Bahrain. Barcelona is big upgrade time for all the teams and new challengers are bound to emerge. Turning to Renault, it has to be said that their car is not nearly as good as Flavio would have us believe. Alonso did his best, putting on a brave show of defending his position and re-taking lost places but it was not enough; one point was little reward for the hard work he put in on Sunday. A more realistic view of the Renault's capability was given by Piquet. He has had a hard time so far this year, with most commentators not taking into account the fact that he did not have the upgrades provided to Alonso until the Bahrain GP and the resultant pressure encouraging mistakes. But in this race he had a car equal to Alonso's and gave himself hope by using it as well as could be expected. In the process, he provided us with a useful yardstick to the car's true performance - it is good for about tenth place. Whether this will prove enough to ensure Piquet's survival in the team is doubtful. Rumor has it that he has two more races to show what he can do and so a much more consistent performance is necessary from now on. One more instance of throwing the car off the road may well be the end for him. So interesting was the Bahraini GP from a strategic point of view that it is worth having a look at some of the other teams too. What is going wrong at Williams, and what of Toro Rosso and Force India, for instance? I will save that for tomorrow, however, as it needs more thought; expect a part two, therefore. Like many others I also thought that Timo Glock would be the faster in the race of the two Toyotas, but the veteran Jarno Trulli clearly showed that he can more than only one fast qualifying lap. I really hope that Toyota will get their win this year, but like you, I also think this was the best chance to do it. I am looking forward to read your thoughts about Williams. They seems to follow the path as the years before, starting strong and then fading fast to the end. I don't understand how Toyota fail so badly in F1. The F1 team is built on the foundations of the team that won so many world rally titles and ran a successful sports car program. You would think that there must be some proper racing brains in there somewhere but there is precious little evidence of it. Maybe the scale of the F1 operation has diluted their effect or is sufficiently high profile and therefore costly for the men in Japan to take an active interest and impose their systems. Whatevet the reason I have no faith in Toyota ever achieving any success in F1. In fact on Sunday before the race I predicted that there would not be a Toyota on the podium and despite being shot down in flames I felt almost vindicated by the result. Trulli is undoubtedly quick but for me he is flawed goods. I have often seen him drive like a champion for 20 laps only to lose a place then look like he has lost composure as he drops down the order. It's almost as if he believes he can't be overtaken and as soon as he is his invulnerability is shattered and while he gathers his thoughts he loses another three places. I think Glock is the better long term bet for the team but if he is as good as I think I don't see him hanging around Cologne for long. Clive and I had a discussion about Timo around the start of the year focussing on his performance in the GP2 race where Hamilton spun and dropped about 20 positions. He then overtook all bar one of the drivers in front of him. The only reason he didn't win that race was Timo Glock who was the only driver capable of making Lewis work hard to overtake him. As a result of the conversation I have been watching Glock closely this season and have been impressed. He may not be a Hamilton or Alonso but he is definitely only one level below them. The more I think of it the only way I can see Toyota succeeding is for them to sign a Hamilton or Alonso and building the team round them and let them bring in the people they want to run it their way. If that is unacceptable to the men in suits they would be as well packing up now and saving their money because their way ain't working. Hum.. I was thinking that with Toyota maybe only the drivers have started to believe in their 2009 chances but that the pitwall crew have yet to grow into the thought of actually having reached near complete competitiveness. To me it seems like they can see what their car is achieving but they are still caught up with years of trying and defining and failing so that they now seem as if caught in the head lights of it all. Somehow I just can not see either of the Toyota drivers winning a GP just yet but that alone will be more likely than ever seeing Webber winning one. In my view it is clear that the Toyota guys will have to start believing and leave the past behind. They have to learn the basics of running two cars up front and quit behaving as if running two cars where they have been for the past decade :-). Oh and on the point of Hamiltobn v. Glock dont you think it was only a matter of time as to when Lewis would pass Glock who after all already had F1 experience - one lap more and Hamilton would have shown him the how-to. Michael: John Howett reckons that part of the problem is that the team are trying too hard and that would figure with your thought about their ability to believe victory possible. I have some hope that the team will achieve a win this year, even if it comes by luck. Not only would that inspire some confidence into the team, it might also ensure their survival into next year! As regards Hamilton and Glock, there is a YouTube video of Hamilton's famous GP2 race in Istanbul that answers your question. Lewis had fallen way down the field after an early mistake but passed other drivers as though they were standing still - until he came to Glock. Timo made him fight for it, refusing to give in when passed on one corner and coming back at him for the next. It took several goes before Hamilton was able to make a pass stick and then he hurtled off after the next car in line. grrrrrrrrr Oh well, yes CLIVE you are right - BUT :-) Glock was fortunate to have had prior F1 experience by that time - just to keep it fair. Oh - and did you see Vettel constantly kicking up dirt in Bahrain whilst chasing Trulli? He was really on the edge great to watch over and over he slid off the track trying to keep up with Trulli. Gosh - I dread to say But ever since his BMW testing days I sensed this Vettel will become youngest ever F1 Champ. He is such a cool breeze! I know I sound like a broken record but if Vettel is so fab how good must Paul di Resta be? If the first rule of motor racing is that you must beat your team mate the top priority version of that must be that you don't lose a championship to your team mate. Paul di Resta was Vettel's team mate in the F3 Euroseries and beat him to the championship. If Vettel is as good as the hype then di Resta must be about the best driver without an F1 drive. Michael: Good point - I tend to forget that this isn't Glock's first taste of F1. Steven: Regarding your first comment (which I neglected to answer earlier - sorry), I did think of their lack of a front line driver when writing the post. And that reminds me of the time they decided against making an offer when Alonso was up for grabs after leaving McLaren - what a mistake that was. I think both Trulli and Glock are capable of winning a race but probably not the championship. Jarno is racing better now than he ever has and Timo is certainly no slouch. Both lack consistency, however.